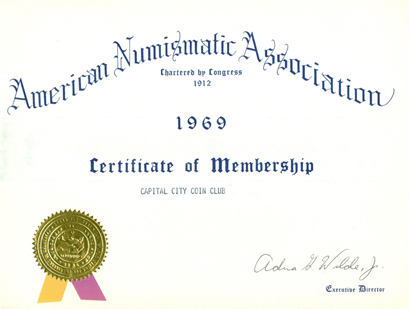 The Capital City Coin Club was founded in 1969. Our first coin show was in 1972 and the club has held at least one show every year since. Some of the original club meeting locations were the Travis County Court House, The Austin History Center and several local city libraries. Every few years we donate a copy of the new Red Book: A Guide Book Of United States Coins to local libraries and elementary schools in and outside the Austin area. There have been club meetings every month since the club was founded. After a short business meeting we normally host numismatic programs delivered by members or guests. On occasion, we include a "show and tell" by members or a video program. This is followed by door prize drawings and sometimes a small auction of numismatic items by the members. Membership dues in 1969 were three dollars a year and they remain three dollars to this day. This entitles the member to free admission to the yearly club show and three other shows held at the same facility. Any member who attends at least three meetings throughout the year will receive an invitation for themselves and one guest to attend the Christmas Dinner.